Step 1. Place of purchase. 1. 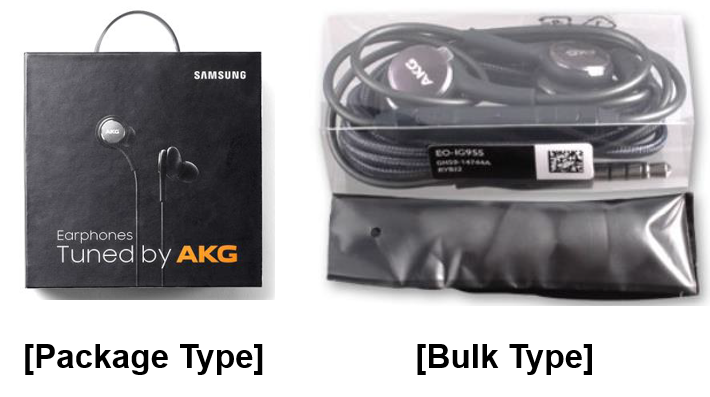 Bulk type: In-box earphones when customer purchased or ASC. 2. Package Type : Purchased separately from Samsung authorized stores and dealers. Step 2. Material of wearing part and engraved or embossed character are different. 2. Point below ‘L’ character is large. 3. ‘L’ is embossed and ‘R’ is engraved. 2. Point below ‘L’ character is small. 3. ‘L’ is embossed and ‘R’ is embossed, too. Step 3. Printing condition(Logo of AKG) and thickness of (Deco) are different. 1. Printing condition is clear. 2. Thickness of ‘Deco’ is thin. 1. Printing condition is poor and unclear relatively. 2. Compare with official product thickness of ‘Deco’ is thick relatively. Step 4. Appearance of connection jack part and length of wire are different. 2. Compare with official product wire (to the separation part) is short. What is HSDPA (High Speed Downlink Packet Access)? What is the difference between GT-i9100 and GT-i9100G?